‘Test types’ is a fuzzy term, with few widely accepted definitions. Here, we'll try to unravel the meaning by showing how we work with them in our agile projects at Making Sense. 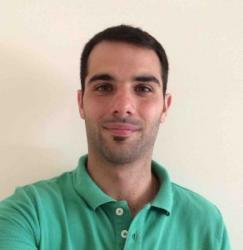 Celeste es Senior QA Automation Engineer. She is a super dynamic and energetic girl, who enjoys playing tennis and painting. A good dinner with frineds is always welcome. Lover of the nature and music. She lives in Tandil, Argentina. Everyone knows why developers test and we have been talking about it in previous posts. In case you need a reminder, here it is: software testing is performed to verify that the completed software package functions according to the expectations defined by the requirements/specifications. The overall objective is not to find every software bug that exists, but to uncover situations that could negatively impact the customer, usability and/or maintainability. So basically, a test is a unit of work that controls the inputs of another program, called the SUT (System under Test). It then verifies that the outputs meet a certain criteria. A test output is used to determine whether the test passed the verifications or failed. What Makes One Test Different From Another? Surprisingly, there is no standard or a widely-accepted definition of test types. Even our good friends from Google have faced this non-standard language issue and wrote about it in this article. They define “tests” as small, medium and large. The problem with those terms is that they’re far too generic to be useful. Different people might say different things about test types. Making Sense works on different kinds of projects which use different technologies. As a product and service software company, we have adopted common language and concepts around this topic. 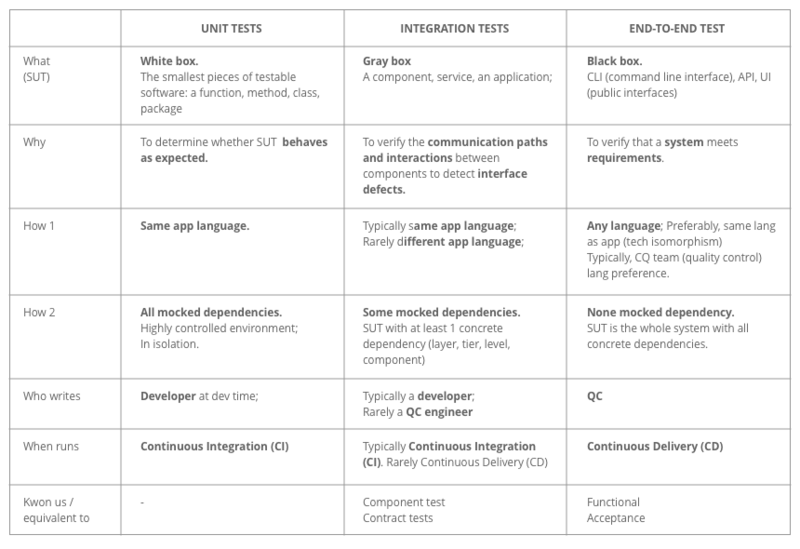 Note that the most accepted test type definitions are the ones for unit and end-to-end tests. When it comes to talking about integration tests, there’s a lot of confusion and diverse opinions about what they comprise. We’ll try and clear that up right now. Clear Definitions of all 3 Test Types. If you take a look at Table 1, we describe the vision we have here at Making Sense regarding automated test types. It has helped us to build a common domain knowledge among our team members. As a result, we feel that we are able to communicate much more effectively in our goal to support our agile methodology. Regardless of the terminology you adopt, it’s a good idea to implement a 3-level approach like the one described above. Of course you’ll need heavy doses of common sense so that you end up making sensible decisions. But we are confident that with this approach, you’ve got the tools you need to contain the most number of bugs with the least amount of time spent during the development phase of your next project. Hope this helps! Should a Business Analyst Have a Technical Background? Is it true that you don't need to have technical skills or background to become a Business Analyst? Here I share my experience and thoughts about it.